The beginning of 2016 meant a new round of student orientation at Webster campuses around the globe, as many students either began their college studies or their study abroad experience at a different campus within Webster's network. 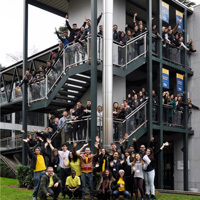 In Geneva (pictured, left), a record number of study abroad students (51) began for the spring term, many through the WINS network (Webster International Network of Schools) and hailing from several continents. During their orientation the new students at Webster Geneva were able to enjoy a taste of Swiss tradition with a trip to La Givrine and St.Cergue. There they took to the slopes for some sledding followed by a traditional Swiss fondue. Pictures and info can be found in this Webster Geneva story and in this Facebook album. Buffet in Leiden: In Leiden, students were welcomed to the Netherlands with a buffet of local food and plenty of bread to go around. Check out photos from the Webster Leiden event here. Ice Skating in Vienna: In Vienna, group outings included ice skating outdoors in the heart of this beautiful city. Learn more about Vienna's Spring 2016 New Student Orientation in this Webster Vienna story and see more photos in this album at the Webster Vienna Facebook page. At the home campus in St. Louis, new students from abroad were welcomed through a week of activities for International Student Orientation. See snapshots from their events here. Meanwhile, the climate wasn't exactly fit for outdoor ice skating at the Ghana and Thailand campuses. 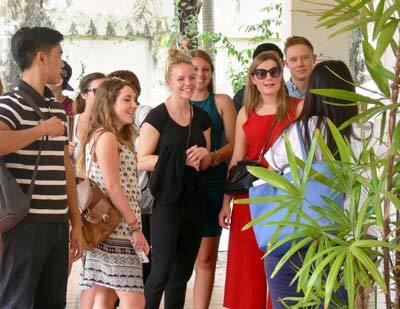 See photos from new students getting acquainted with the campus in Cha-Am here, and graduate students at Bangkok Center in the nation's capital here. New students in Accra, Ghana, also got to know Webster, including the faculty and staff and the resources around the facilities there. See photos of Webster Ghana's orientation here.